▷ Best Platinum and Grey Highlights 2019 ¡Photo ideas & step by step! 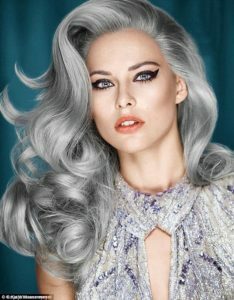 Gray hair, typical of grandmothers, has been among the trends of beauty, yes, only for the most daring women. 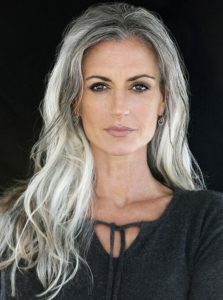 To have a completely gray or white hair is a brave decision, which surely many resist the principle of having gray hair. 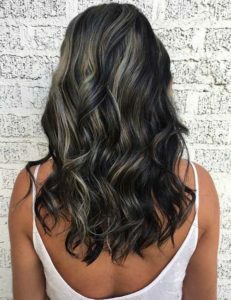 We consider that this hair color is for old people, but now it´s a trend between young adults and it will actually make you look edgy and modern. Genetics, the passage of years, stress and certain diseases make our hair lose its color and turn gray or white. They are the hateful gray that we are so worried about and that most of us prefer to hide. But if men with gray hair are attractive to us. So far only some celebrities of a certain age had dared to face their gray hair and wear a platinum gray on their heads: Jamie Lee Curtis, Vanessa Redgrave, Judi Dench and Christine Lagarde. Generally begin to appear gray hair at age 30 and since then becomes irreversible. We know that when they arrive we can´t stop it. 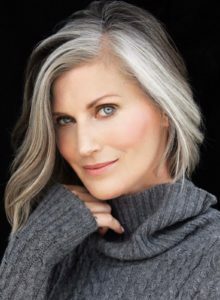 Covering them with dye is the most usual choice, but many women are encouraged to leave their gray hair, especially when it becomes complicated to cover them. In the case of young ladies, they have tried this fashion to look chic and modern to go to work. The loss of melanin that gives hair color, the degradation of keratin or dying your hair a lot is a determining factor for hair health. And here will influence all that we usually relate to hair damage: the excessive use of dryers, exposure to chlorine and sun. Hair white, gray, blonde or brunette, all this kind of hair suffer the negative impact on the hair and over the years can result in gray hair has a yellow shade. But it’s never too late to act. If your hair has been mistreated and you fear that your gray hair has a yellow shade, there are products to repair the damage in your hair and leave it the desired color and texture. 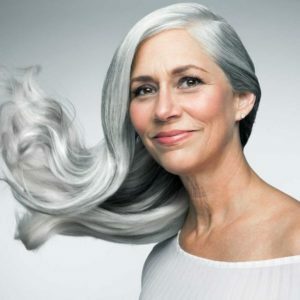 You can proudly wear your gray or white hair, taking into account these tips to care for and improve the hair fiber, aiming to avoid dryness and change the tint tone. Six months before: When you decide that you want to be a platinum blonde, you should stop dyeing your hair in other colors six months before. If you let your natural hair grow, it will make the bleaching effect even. Two weeks before: It is important to get a deep conditioning treatment. The bleach will dry out and damage your hair. It cannot be helped. That is why it is important to treat your hair beforehand to help reduce dryness and damage previously. Two days before: Do not wash your head so that natural oils can protect your scalp during the bleaching process. It is important to consider how is the shape of your face to know the tonality and intensity that you will give to the color. You should consider that if you have a thin or thin face, the thick wicks are ideal and perfect for this type of face to frame your face frame correctly. On the other hand, if you have a round or broad face you should use the platinum wicks to give light and illumination to the back of your head starting at the nape of the neck, this will make your hair stand out no matter what haircut you have. The type of haircut that you have will influence the type of wicks that you will make. After examining and being clear about the shape of your face, you have to continue with the type of cut that you currently have. Decide if it is uniform or more scrambled with asymmetric shapes. Since if you have even hair from the root to the ends, the applique that you make will be much more linear and orderly. If your cuts are asymmetric or you have bangs to apply platinum wicks in this case would change as you look for more prominent places where it offers a harmony to the visual regarding the haircut you have. The tone you use for your hair color will be something important to get the desired result for your wicks. If you have to take into account both the type of eye color you have and the skin. If you have the color of brown skin and the eyes are brown, it is best to have a dye of golden lights so that it is combined in a homogeneous way visually. On the other hand, if you are blonde, the platinum base (platinum) will be the best to highlight the color of your skin. 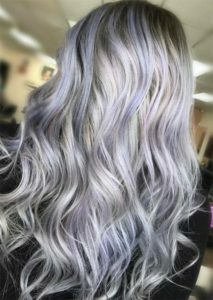 If your platinum look is not a sufficient change for you, then you could choose some purple highlights to enhance the look. You get the best of both worlds and have more fun!. 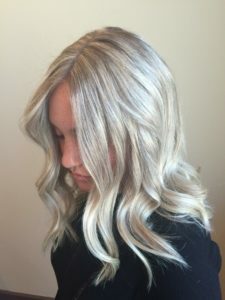 This blonde platinum tone is perfect for someone who does not want to make a big change The color of the blonde on the roots rotates slightly in a light in the grey shade. It’s a popular shade of platinum hair color. 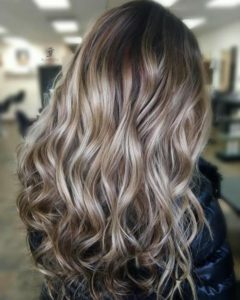 If you want something subtle you can try these highlights, light brown else usually have a huge variety of shades, so this highlights will bring light to your face. Another basic point is its thorough maintenance to keep it beautiful. Gray or white hair tends to yellow, losing its appeal. The stylist David Lesur recommends “going to the hairdresser every 3 weeks for a touch-up of nuance first, then root, so that the gray color does not lose its shine. Hydration: use products that keep hair hydrated, either shampoo or cream treatment. Lines dedicated to dry hair are ideal or you can try natural mask with ingredients that you may have in your kitchen like avocado, olive oil, coconut oil, etc. If you are going to try dying your hair by yourself, check this video to start getting involve in hair dye. Drying: to avoid the heat of the dryers, use the option of cold air that today comes in every dryer, if yours doesn´t have it, use the first mode which is the most soft of all. If not, make it even simpler by letting it dry with the wind. Hairstyle: again, the idea is to avoid exposing gray hair to heat. If you usually use curling iron or loop, dust off the rollers and return to the curlers as they were before. Your hair will thank you. 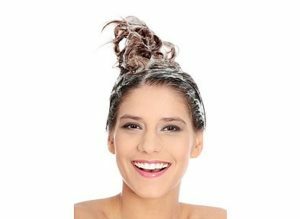 Products for gray hair: although the world of hair care seems exclusively aimed at covering gray hair even though grey hair is a trend of this millennium. 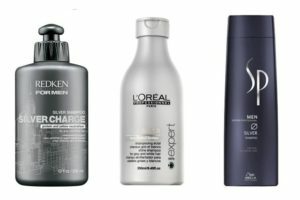 There isn´t a huge amount of hair products for grey hair. But, you can find good brands to maintain your color, there are brands that have paid attention and saw that dying it is not the only option for women. Pantene, L’Oreal, Matrix and especially Jhirmack offer specific products for gray hair. A matter of color: to have a white or radiant gray hair, avoid hair products that have red, yellow or orange pigment, to prevent your gray hair from absorbing those shades, because, this hair tone turns into yellow very quickly. In fact, the treatments to improve the appearance of gray hair are usually of opposite colors, such as violet and blue, which counteracts the yellowish one we want to avoid. Every two weeks a protein mask should be used to reinforce the hair cuticle that has been damaged during the bleaching process. Perhaps the most important part is to touch up your roots every four to six weeks to avoid a difference between the color of the root and the rest of your hair. To get the perfect silver gray it is essential to go to a professional. Before being seduced by the trend of gray hair, we must take into account that it adds up for years. We recommend “the application of a few highlights of fantasy of different colors, to get a more modern touch, and avoid that feeling of aging”. But gray hair also looks good in long hair, especially if the darker roots remain or are added some pinkish or purple streaks. As for makeup experts recommend using bright colors, especially on the lips, to get a nice contrast. Evaluating your hair: If your hair is blond or light brown, it will be quite simple to dye it silver. If it is brown or black, the process will take time to remove all its color from your wicks. Those with very dark hair should clarify slowly for several months, first dyeing brown tones until it can be reasonably stained to silver. Read all the instructions of the dyeing team you chose. Each instruction may vary slightly; it is important that you focus on the process before you begin. Wet your hair completely: Each wick must be wet. Use a towel to remove excess water. Cover your shoulders with the towel: The hair dye will color anything porous that it touches. Make sure you cover any surface you do not want dyed. Put on latex gloves: Some dyeing equipment include latex gloves. If yours does not have them, you will need to buy them separately. If there is any dye in your hands, keep in mind that it dries your skin a lot and may take a while to go. Mix the ingredients of the dye following the instructions of the equipment and apply the mixture on your hair: Make sure to apply it evenly throughout your hair. Get the help of a friend to make sure that the back of your head is completely covered with the tincture. Use haircuts to keep hair on top of your head if it is too long. Leave the tincture on your hair for the specified amount of time. Like light colors, the silver dye removes your hair its previous color. If you leave the dye longer than specified, you can seriously damage your hair. 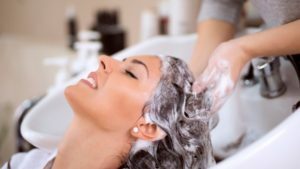 Rinse your hair dye: The best way to do it is in a closed area such as a shower or a bathtub and not on the sink. Continue rinsing your hair until the water runs clean. Apply the equipment lotion: Most of these include a lotion that will condition to protect your hair after coloring. But, don´t forget to keep searching about this topic to see really good results in your hair and to not cause a huge disaster in your look. Do you dare to join the trend of gray hair? 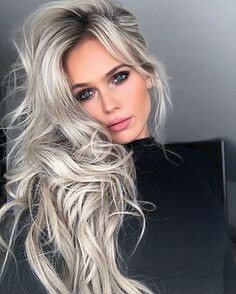 Undoubtedly it is a fashion only suitable for the most daring women, who like to change their look in a habitual way, and who do not fear being the center of attention, because if you dye your hair silver gray, all eyes will be on you. If you liked this article don’t forget to comment in the comment box bellow and share with your friends and family.